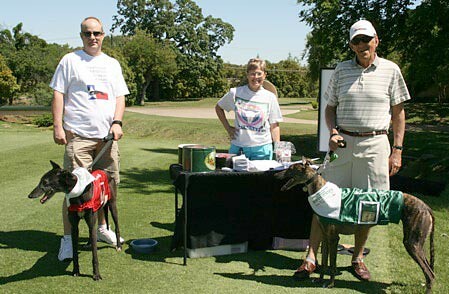 GALT was a proud sponsor of the Forest Park Bryan's House Open, held on May 3rd at Gleneagles Country Club in Plant, Texas. 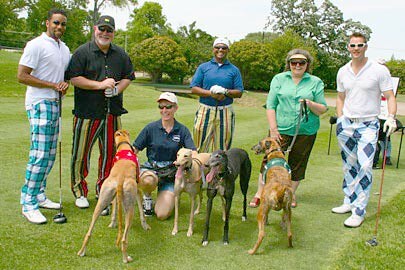 The golfers, our volunteers and foster greys enjoyed beautiful weather for most of the day; the rain waited until the golfers were all finished with their rounds! Several GALT members and other donors attended the post-tournament dinner and silent/live auctions. It was a fun day for a greyt cause! A tip of the GALT hat to Ron Christian, who captained GALT's golf team -- joined by Tom Freas, Rick Cofer and Oscar Oswalt. table on the #6 tee box.